About "Angles and their measures worksheet"
Worksheet given in this section is much useful to the students who would like to practice problems on angles, their measures and their classifications. Name the angles in the figure given below. Each eye of a horse wearing blinkers has an angle of vision that measures 100°. The angle of vision that is seen by both eyes measures 60°. Find the angle of vision seen by the left eye alone. Plot the points L (-4, 2), M(-1, -1), N (2, 2), Q(4, -1) and P(2, -4). Then, measure and classify the following angles as acute, right, obtuse or straight. There are three different angles. 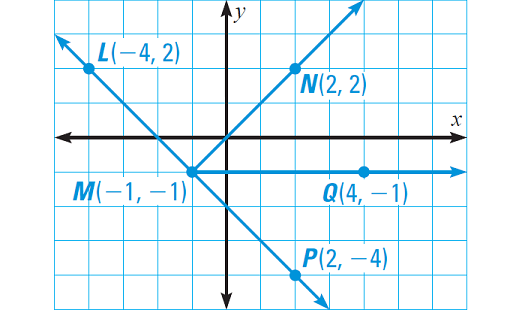 We should name any of the angles as ∠Q, because all three angles have Q as their vertex. The name ∠Q would not distinguish one angle from others. We can use the angle addition postulate. Hence, the vision for the left eye alone measures is 40°. Plot the given points in xy coordinate plane. We can use the protractor to measure and classify each angle as shown below. Two angles are adjacent angles, if they share a common vertex and side, but have no common interior points. After having gone through the stuff given above, we hope that the students would have understood "Angles and their measures worksheet".